HMH Books for Young Readers, 9780544319608, 40pp. 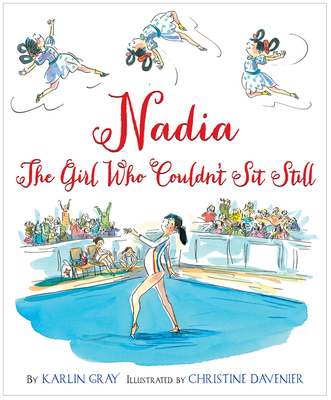 Expert illustrations that capture the energy and fluidity of Nadia's exuberant gymnastic routines and referential back matter round out this inspirational story of determination and overcoming adversity. A perfect 10. As a little girl, Karlin Gray loved gymnastics but she wasn't feisty, fearless, or focused like Nadia Comaneci. Karlin had no problem sitting still . . . daydreaming and, eventually, writing. After working several years in publishing, she sat down and wrote her first picture book, Nadia: The Girl Who Couldn’t Sit Still. Karlin lives in Connecticut with her husband, son, and a very bouncy dog.